Ubisoft is promoting Far Cry Primal by offering two "lucky" contestants the once in a lifetime opportunity to spend a night in a cave. I can't imagine why you'd feel compelled to spend a night in a jagged hole in the earth with none of the material comforts of civilization, but if you do, this contest might just be for you. To enter, just send a tweet to the official Far Cry Primal twitter account explaining exactly why you want to spit in the face of thousands of years of technological development and sleep in the dirt like an animal. Be sure to include the #cavebnb hashtag. The, uh, "lucky" winners of the contest will be flown to France, given a day of survival training (including meals and a night at a "standard" non-cave hotel in Lourdes), and then promptly left to fend for themselves in the middle of the French wilderness. "By day, you'll develop new skills and learn to fight the elements by taking part in an intensive survival course with one of our experts," the contest site explains. "Once nights falls, you'll have to deal with an inhospitable environment and survive in the most extreme conditions, spending the night in a cave with very few comforts. Do you really think you're up to it?" Unfortunately, the contest is only open to residents of France, the UK, Germany, Spain, Belgium and The Netherlands. Gamers outside of Europe will simply have to suffer in their air-conditioned, central-heated, fully-stocked homes. Tragic. For legal reasons, I have to mention that Ubisoft probably won't let its customers die of exposure in the French wilderness. 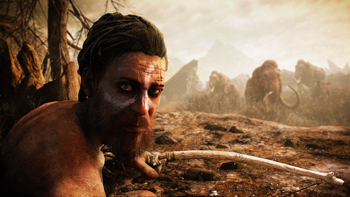 Far Cry Primal is set to launch on February 23rd on PS4 and Xbox One, with a PC release to follow on March 1st. I'm guessing 'Cave' is an avant-garde French pornstar? How many watchtowers do we have to climb in order to pass the training course? oh no I'm unable to sign up for the contest(sarcasm). I'm very sure this sounds like a fun idea for someone people but I don't see the appeal. Plot twist...The scenery falls away and you're in a new reality show co-hosted by Brian Blessed and Vic Reeves, sponsered by Ubi (possibly EDF too). Who will survive the ...err...the ruthless, unforgiving wastes of...France? Well i guess we all got to start somewhere. I'm sure there's quite a few sharp rocks one could slip and fall on. I would usually be interested in this harmless sounding reality sleepover, but current mental state may be a little unfair on the other poor soul if it does happen. Someone will be watching always, no doubt too. That kinda is a little disconcerting. Grr, double posted for some reason. Sorry. This seems more like the prize you'd win by getting lost on a camping trip. I can't imagine there will be any real survival skills necessary beyond not getting eaten. They'll probably check the cave out for bears before they send you in ... then again we are talking about Ubisoft. I wouldn't put it past them to have this just be a publicity stunt with an actor dressed as the main character hunting the most dangerous animal of all with a film crew nearby. Umm... how much survival skill does one need to survive a single night, cave or not? It's not like you're going to starve in that time frame. I've slept in a cave. It's not that bad. About the worst you're likely to encounter is a sore back from sleeping on a hard or uneven surface. Umm... how much survival skill does one need to survive a single night, cave or not? How cold does France get? Like, unless they're up in the mountains, I don't think there's anything they'd have to do apart from count sheep to distract themselves from the cold. The reward sounds more interesting than the game, and the reward is indistinguishable from the end of a really bad night out for me. Doesn't really say much for Rust, Far Cry version. Is this some weird way of making us suddenly appreciate how "advanced" UPlay is? You mean MAN?! How do we know this isn't a reality show? They said IN a cave, not WITH it. Sorry to burst your bubble. Im sorry but come on.... how much training do you need to stay a night in a cave. Here children, this is where the rocks are. This is the dirt. You sleep on dirt not rocks. Rocks bad, dirt good. Good cave man, on you go and prosper for the good of humanity! Oh yeah? And what if that cave happened to lead to the Lost World? Bet you'd be feeling pretty silly not having any training when a 8-story tall crustacean from the protozoic era is asking you for money, wouldn't you?! Oh I'm sure Cave and I can find ways of sleeping with me being inside her to some degree. Won't be a problem. She is very flexible and open-minded after all.